There are so many decisions to make during an AmaStella cruise: Have breakfast in the lounge or the main dining room? Take a walking tour, go on a hike or bike ride? Red or white? The choices seem endless on this narrow slip of a ship as it sails down the Danube River between Amsterdam and Budapest, and along the Main and Rhine through the Czech Republic, Germany and Netherlands. AmaStella launched in 2016. Its understated comfort and spaciousness provides a welcoming atmosphere. Staterooms are generous in size; most feature twin balconies and adjoining rooms are available. Features like a spa, hair salon, fitness center and relatively large gift shop set it apart. There is even a heated swimming pool with a swim-up bar on the Sun Deck. The staff is very friendly and professional. They take pride in every task and genuinely try to assist in any way they can -- from the captain, cruise manager, hotel manager and chef to the reception desk clerk, wait staff and room stewards. Three standouts make AmaStella exceptional: stateroom size, fine dining and the number of excursions available. 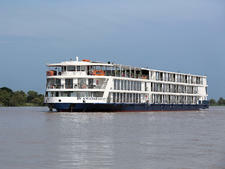 Every stateroom features seating, desks and, for a river ship, spacious bathrooms. Dining is outstanding. One chef's duty is making all the bread; another chef is in charge of deserts. The kitchen team and excellent wait staff could easily be compared to any fine dining restaurant. The number of excursions and choices is remarkable. On many days there were morning, afternoon and evening excursions; most included in the cruise base price. At many ports of call, passengers were also offered gentle walkers, walking, hiking and biking choices. AmaStella passengers are from the United States, Canada and other parts of the world with ages ranging from children 8 and up, young adults and over 55. The itinerary includes hiking and biking excursions, walking tours and gentle walker tours creating opportunities for all age and interest groups. Announcements are in English; however, arrangements can be made to accommodate Spanish- and Japanese-speaking guests. The dress code is casual from jeans, shorts and T-shirts to dress slacks and collared shirts for men; and sundresses, shorts and T-shirts, and dress pants and blouses for women. The “Captain's Farewell” dinner is more formal with suit coats and dresses, but generally this is a casual ship. It is advisable to bring raingear during the summer months and appropriate cold-weather gear for the Christmas Market cruise. Umbrellas are provided for every guest. Daily excursions (sometimes more than one); fine dining with wine, beer and soft drinks at lunch and dinner; shuttles to town when appropriate; a fitness center; complimentary shipwide Wi-Fi; in-room computers; entertainment on demand, including movies; a fleet of bicycles carried onboard for passengers to enjoy on their own or on guided bike tours; and all onboard entertainment are included. Tips are not automatically included. Passengers can individually tip at the bar or the spa. At the end of the cruise, tips can be added to a credit card or paid in cash. Suggested tips are $12 a day per passenger for the crew and $3 a day per passenger for the cruise manager. The preferred currency is euros.